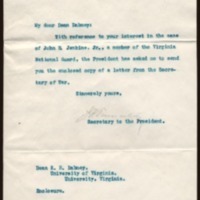 Joseph P. Tumulty writes to Richard Heath Dabney, regarding his interest in John B, Jenkins, Jr. and enclosing a letter from Newton D. Baker to Woodrow Wilson. With reference to your interest in the case of John B. Jenkins, Jr., a member of the Virginia National Guard, the President has asked me to send you the enclosed copy of a letter from the Secretary of War. Tumulty, Joseph P. (Joseph Patrick), 1879-1954, “Joseph P. Tumulty to Richard Heath Dabney,” 1917 January 13, WWP20517, University of Virginia Woodrow Wilson Letters, Woodrow Wilson Presidential Library & Museum, Staunton, Virginia.